Joel Hetrick jumped out to the early lead in moto one, but after suffering a crash had to work his way through the pack. 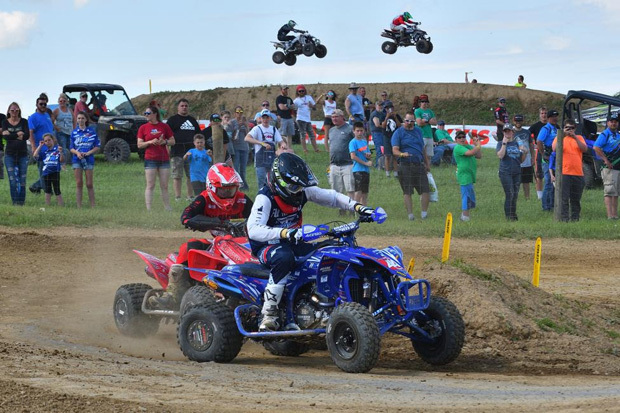 MORGANTOWN, W.Va. (May 21, 2018) – Round five of the 2018 ATV Motocross National Championship (ATVMX), an AMA National Championship, hit High Point Raceway head on as predictions of rainfall were forecasted throughout the week leading up to this past weekends event. The storms split and spaired the track, and temperatures were in the low 80’s with plenty of sunshine. The threat of rain diminished the fans in attendance were treated to some of the best racing action in recent memory. 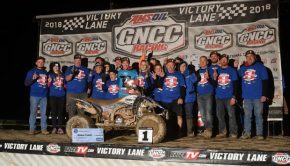 It was anticipated that since this ATVMX National was in Rockford Fosgate/Ti-Lube/Honda’s Joel Hetrick’s home state and a hard-packed track that he would be blazing fast. 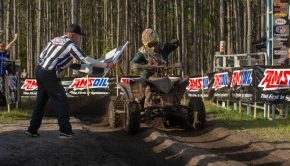 Hetrick went out for timed qualifying and set a blistering pace, claiming the ATVRiders.com Fastest Qualifier award. The stage was set as moto one neared and the excitement began to build. Hetrick wasted no time getting into the lead, and looked to be in his groove until a mistake on lap one cost him the lead. Hetrick found himself frantically making up time as Wienen Motorsports/Yamaha/Maxxis’ Chad Wienen and Baldwin/Jeff Rastrelli Land Grading/Ford Brothers Racing Honda’s Jeffrey Rastrelli charged into the lead. 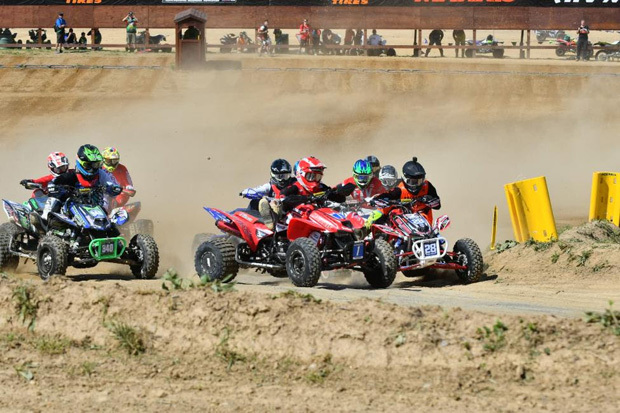 Ahead of Hetrick the race took on a new dimension as Wienen and Rastrelli battled bar-to-bar. Rastrelli would be able to find his chance to take over the lead, as he has been looking for a breakout race. Rastrelli now held this moto’s destiny in his hands, but Wienen kept him in check by keeping the pressure on as the laps started adding up. Wienen and Rastrelli battled throughout moto one for the win. Wienen would come away with the win and Rastrelli would finish third. 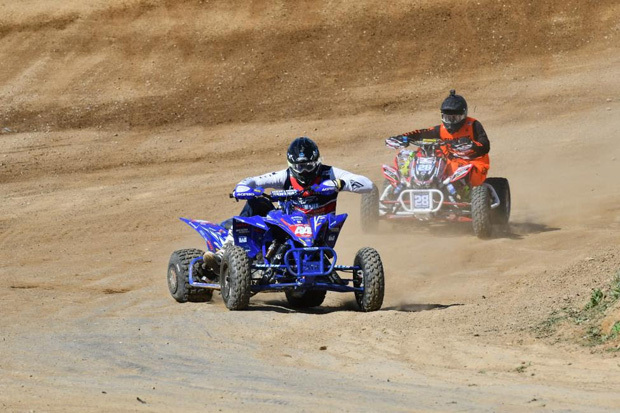 Behind the leaders, Hetrick was on a mission as he had raced his way back to the front. Hetrick made his way through the pack, and was now pressuring Tbrown84 Training/CST Tires’ Thomas Brown for the fourth spot. The racing action started happening fast and would set the stage for an all-out battle to the checkered flag. Wienen emerged with the lead late in the race as Rastrelli made a mistake and watched his hopes for a moto win disappear. Brown would go down in the same spot Hetrick had earlier in the moto allowing Hetrick another position as he continued to run down the leaders. When the checkered flag came out, Wienen had sealed the deal on the moto with a win as Hetrick had put in an incredible race taking second with Rastrelli claiming third. Moto two was looking to be every bit as exciting as the first with Wienen knowing he needed to get in a very solid ride and for Hetrick to be off his game. With Joel ready to redeem himself, the gate was about to drop on another intense battle that would last from the gate to the checkers. Moto two saw Wienen and Hetrick battling bar-to-bar, but Hetrick would make a pass late in the moto for the win. Hetrick and Wienen started the battle right off the gate as the pro class headed for the first turn with Wienen getting enough of an edge that would come out in front as they hit the downhill rhythm section. As the dust cleared, it was blue and red out front and neither rider was making mistakes or giving an inch as the moto pushed on. The battle would last until Wienen made the slightest mistake allowing Hetrick to make a clean pass and obtain the lead. 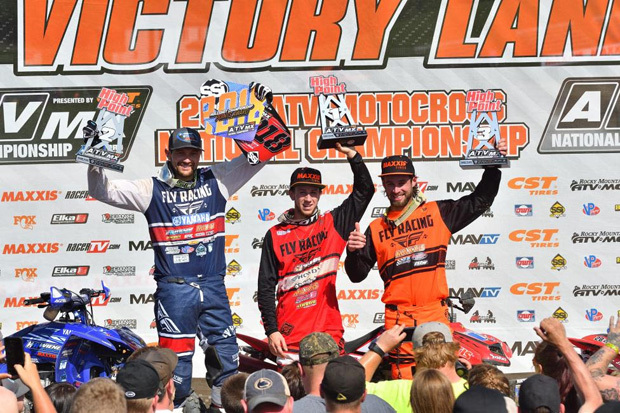 The moto would end with Hetrick securing the win, Wienen taking second and Rastrelli once again taking home the third spot as the podium celebration began. Behind the trio on the box, Brown would roll out of High Point earning a solid fourth place overall finish. After finishing on the podium at the previous round, Brown was hoping to repeat his success at round five. While GennUSA Racing’s Nick Gennusa rounded out the top five overall. Gennusa has been improving each round after suffering from an injury earlier in the season. Joel Hetrick (center), Chad Wienen (left) and Jeffrey Rastrelli (right) rounded out the overall podium at High Point Raceway. 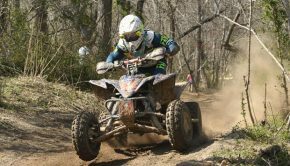 The 2018 ATV Motocross National Championship (ATVMX) will continue with round six Saturday June 2, 2018 with the Muddy Creek ATVMX National located in Blountville, Tennessee. 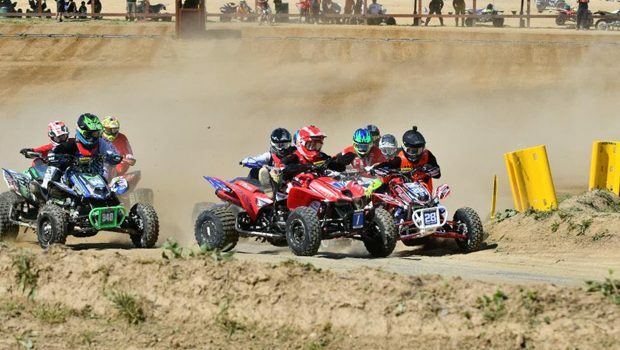 Racer TV and MAVTV are the official homes for coverage of the ATV Motocross National Championship (ATVMX) events. 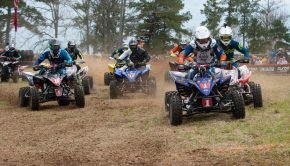 All 10 rounds, from the season opening ATVSX inside the hallowed grounds of Daytona International Speedway, to the ATV Dirt Days finale at the historic Loretta Lynn Ranch in Tennessee, will air in 30-minue; taped-delayed telecasts on MAVTV. Catch all the action at www.mavtv.com and www.racertv.com.